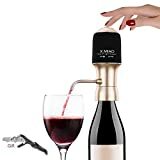 Who wants to waste precious sipping time letting a bottle of wine "breathe" for awhile, sit in a decanter for hours, or risk spills swirling it around in the glass or pouring it through handheld aerators to help open up its flavors? Sure you could quickly pulse it a bit in a blender (it works! ), but then you have created a cleanup hassle. What's a simpler solution? The cool new Aervana is the world's first electric wine aerating dispenser that works with just a push of a button. 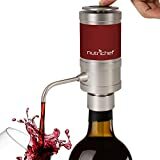 It quickly and effectively aerates and dispenses more than 250 bottles of wine per set of batteries while leaving any sediment at the bottom. 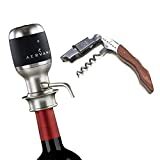 It fits most common wine bottle shapes, has a non-drip spout, and includes two different size tubes. Great solution for wine lovers, especially when entertaining. Check out this video to see it in action. Fast, easy to use and clean. No lifting, aiming, spilling, or guessing. Size: Long : 10.2" / Short : 9.9"